We recently reported on the news that cassette tape sales were doing surprisingly well, with an increase over the previous year. So... if you're buying tapes again, what are you listening to them on? If the trend in tape revival has inspired your musical lust, walk this way as we've been playing around with something that you'll now need. We review the Groov-e Classic Boombox. Look at it - you know what's going on here, don't you? Of course you do, you had one of these in the 90s for your CDs and your (at that point possibly dwindling) tape library. The unique thing about this Boombox, as compared to your 90s one, is that this one was made this year. Yes, it's brand new and will last for years, unlike the one covered in dust in your mum's garage. 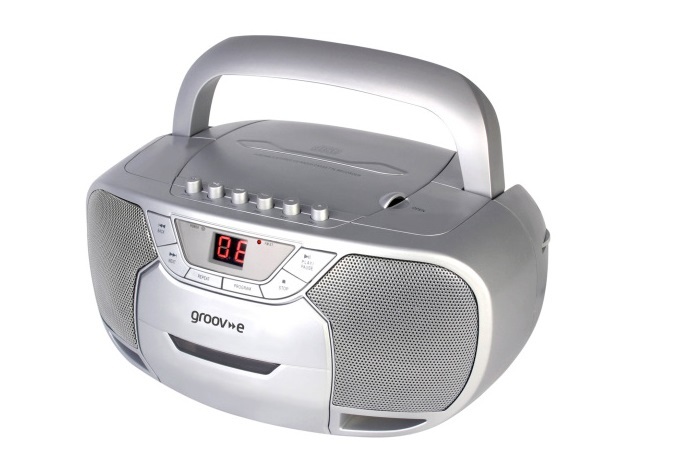 The Groov-e Classic Boombox is a three-in-one music device, boasting a CD player on top (CD-R and also CD-RW compatible, yo), a cassettes deck on the front, and also an integrated AM/FM, non digital, radio. Seriously, nothing has changed in the design of this boombox from those classic days, so there is no Bluetooth support, no remote control, no USB, no HDMI, and no drone that pops out the top to take a selfie of you. It is wireless, though. Well, it can run on batteries, as well as the included power cable, meaning it can be moved about the house to wherever you need those tunes. Also, there is an aux-in port on the back, so you can actually plug in your phone to use the speakers to amplify your digital music collection. On that note, the speakers were pretty impressive, and despite only being 1,2W each, they produced clear and crisp audio with a fair amount of bass oomph. 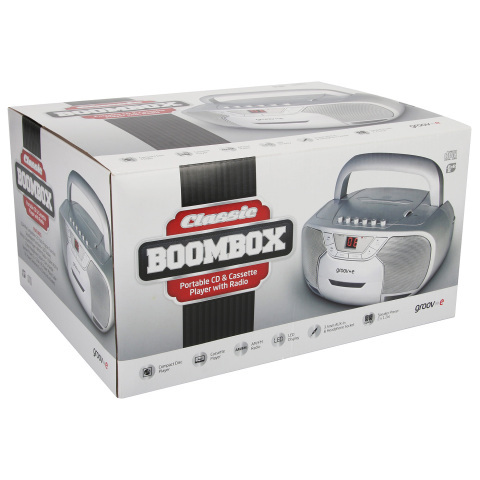 Certainly the Groov-e Classic Boombox is powerful enough to fill a room with sound, and also (once the weather improves) your garden while on battery power. The CD player lets you programme 20 tracks in one go, so there is at least some degree of control over the order of your songs, while the tape player does just that: plays tapes. When you hit the eject button the tape drawer opens smoothly and slowly, in what Alan Partridge would refer to as "a quality action". And that's it, really. If you're a stone cold, cool as ice, hipster who listens to nothing but tapes and CDs, here is your next boombox. Check it out.